Virgin Galactic's space shuttle – the VSS Enterprise has completed its first manned glide flight – with mass space tourism taking another step closer to reality. The VSS Enterprise – formerly known as SpaceShipTwo – was released from 45,000 feet and achieved both of its goals with ease. 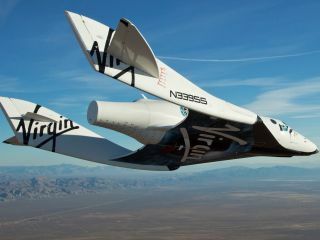 "The two main goals of the flight were to carry out a clean release of the spaceship from its mothership and for the pilots to free fly and glide back and land at Mojave Air and Space Port in California," explained Virgin Galactic's release. "Other detailed objectives of the flight were successfully completed, including; verification that all systems worked prior and following the clean release of Enterprise; initial evaluation of handling and stall characteristics; qualitative evaluation of stability and control of SS2 against predictions from design and simulation work; verification of performance by evaluating the lift-to-drag ratio of the spaceship during glide flight; practice a landing approach at altitude and finally descend and land." Sir Richard Branson was, as you would imagine, delighted that his Virgin Galactic project was moving towards its maiden space tourism flight smoothly. "This was one of the most exciting days in the whole history of Virgin," he said. "For the first time since we seriously began the project in 2004, I watched the world's first manned commercial spaceship landing on the runway at Mojave Air and Space Port and it was a great moment. "Now, the sky is no longer the limit and we will begin the process of pushing beyond to the final frontier of space itself over the next year." More than $50 million has been collected from potential customers, who are keen to be among the first space tourists.